Choice Hotels has announced their upcoming promotion. While this promotion is disguised as a "stay 2x get a 50$ gift card offer" it is really "stay 2x get 8,000 points". For those of you who do not know, Choice Hotels is a collection of mainly lower to mid tier hotel chains (Comfort inn, Comfort Suites, Quality Inn, Sleep Inn, Clarion, Cambria Suites, Mainstay Suites, Suburban, EconoLodge, Roadway Inn and Ascend). While their hotels in the US could best be described as "budget", they have several attractive hotel options in Europe. I have personally stayed at 3 of their properties in Scandinavia: Clarion Sign in Stockholm, Clarion Hotel Temperance in Malmo, and Clarion Royal Christiana in Oslo. All 3 were excellent properties with generous free breakfast included in one of the most expensive regions in the world. They also offer some nice properties in France and several other countries in Europe. It seems that choice has an offer similar to this every year and I think that if you have an upcoming trip to Europe planned this is very much in your interest to look in to. As an example, the Clarion Collection Opera Pavillon in Paris is only 8,000 Points a night and standard rates run upwards of 300 euros during peak season. Obviously it doesn't take a mathematics professor to realize that 2x 50$/night stays at a local Comfort Inn for a free nigth at a nice hotel in Paris is a solid deal. For this promotion you need 2 separate "stays". A stay can be 1 night or 100 nights. To maximize this promotion with a travel partner, you should alternate the name on the reservation every night. For example, a 4 night stay booked under 1 persons account would get you only halfway to a free night. On the otherhand, a 4 night stay where you alternate the name on the booking would get you 2 free nights as the latter would be 4 separate 1 night stays. While the points required for certain hotels do occasionally change, Choice maintains a list of hotels which are less 8,000 points a night or less. *Terms and conditions: Member must register at ChoiceHotels.com before arrival and book their trips at ChoiceHotels.com or 800.4CHOICE at qualifying rates. Member may also book through a travel agent or corporate online booking system. Choice Privileges member number must be provided upon check-in. After a second qualifying trip with arrival between 5/23/13 and 8/21/13, member will be awarded enough bonus points to reach the 8,000 point level, which can be redeemed until 11/1/13 for one (1) $50 gift card at defined retailers on ChoiceHotels.com/giftcard. Only members earning this bonus qualify to redeem for the $50 gift card. Only members that register for the promotion are eligible to earn the defined promotional gift cards during the promotion. Terms and conditions apply to $50 gift card options. See card for details. Choice Privileges Diamond and Platinum members who register and book through ChoiceHotels.com will receive an additional 100 Choice Privileges bonus points with every qualified trip during the promotional period. For Comfort Inn, Comfort Suites, Quality, Sleep Inn, Clarion, Cambria Suites or Ascend Hotel Collection hotels, a trip is defined as a stay that is any number of consecutive nights at one hotel regardless of check-ins or check-outs. For Econo Lodge, Rodeway Inn, Suburban Extended Stay Hotel, or MainStay Suites hotels, a trip is defined as a stay that is two (2) or more consecutive nights at one hotel regardless of check-ins or check-outs. Allow 72 hours from check-out for points to post. You must maintain an address in the U.S. (including U.S. territories) or Canada to be eligible for this promotion. 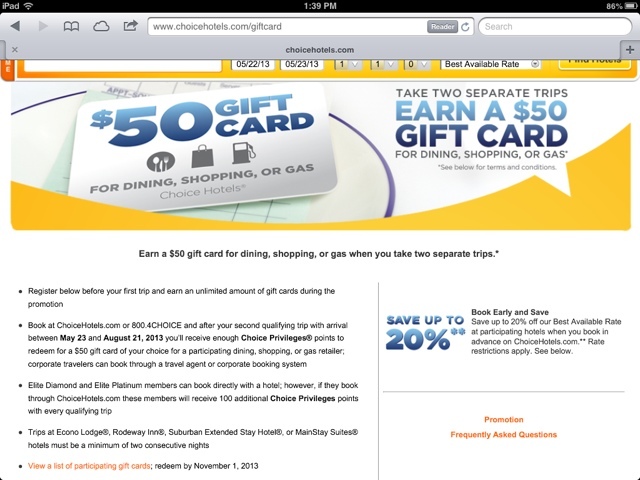 For Choice Privileges program details, eligible rates, eligible countries and point redemption rules, visit choiceprivileges.com. **Rate restrictions: The reservation must be made on ChoiceHotels.com at participating hotels using your Choice Privileges number and must be made at least 7, 14, 21 or 30 days in advance, which will vary based on the hotel for which a reservation is being made. Subject to availability, the rate starts at 15% off Best Available Rate, is non-cancellable, non-changeable and non-refundable. Your credit card will be charged for the total reservation amount within 24-48 hours of booking.